A law firm’s creative fundraisers have already raised £650 this year for a charity which supports people directly affected by, and working with, a potentially fatal skin condition. 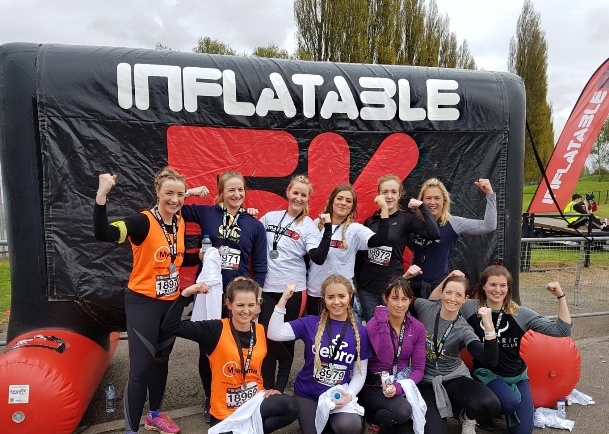 The latest initiative saw Kate Large, a trainee solicitor at PM Legal Services – a division of Keebles (formerly hlw Keeble Hawson) – tackle a series of challenges in the Hull Inflatable 5k Obstacle Run at Beverley Racecourse. hlw Keeble Hawson’s Doncaster office is boosting funds for DEBRA – the national charity for people with Epidermolysis Bullosa (EB) – a potentially fatal skin condition that causes constant pain due to unstoppable internal and external blistering. Additional fundraising activities include Paul Newbert from the Residential Conveyancing Department embarking on a ‘slimathon’ with employees organising sweep stakes at bi-monthly weigh ins. The team has also organised sporting events, raffles and a monthly Dress Down Friday. Sarah Burton, partner at Keebles, said: “We’re off to a great start and our tenacious drive could help to fund research into symptom alleviation and effective treatments for this condition.